One of the very first dishes I ever tried to recreate at home was chana masala. This was before the invention of vegetables, so when I went out for Indian food in my neighborhood, it was usually chana masala, a samosa and basmati rice. I probably started out with a recipe from somewhere, but I would just adjust, adjust and adjust until it tasted like what I would get on Coney Island avenue. Spicy, tangy, and fragrant, almost perfumed, with sweet spices like cardamom and cinnamon. The jalapenos probably have no place in chana masala, but hey, tell that to me 20 years ago. And when chickpeas are the absolute star of the show I prefer to cook dried ones, rather than use canned. The taste is fresher and the texture is meatier. I also find that coconut oil gives chana masala a richness that other oils lack, but since not everyone has coconut oil lying around, vegetable oil will be just fine! Same for subbing lime juice in place of tamarind concentrate. This is one of those recipes that will help fine tune your taste buds. Look for the spicy, the sour, the salty, adjust until you’re thoroughly pleased. Even 20 years later and I’m still adding a little of this or that. Preheat a large pan over medium heat. I prefer a pan to a pot, because it gets the tomatoes to cook down faster. Meanwhile, mix together the spice blend in a small bowl. When the pan is hot, saute the onion in the coconut oil for about 10 minutes, until nicely browned. While it’s sauteeing you can prep the rest of the veggies. Add the jalapeno, garlic and ginger, and saute until fragrant, about 30 seconds. Add the cilantro and saute until wilted. Add the spice blend and toss to coat the onions, letting the spices toast a bit (about a minute or so). Add the tomatoes and mix well, scraping the bottom of the pan to deglaze. Add salt and pepper, chickpeas and agave. Cover the pan and bring heat up a bit. The tomatoes should take about 10 minutes to breakdown and get saucy. Remove the lid, and cook for about 20 more minutes on low heat, so that the flavors meld and the sauce thickens. It shouldn’t be too thick (like a marinara), but it shouldn’t be watery, either. Add lime juice or tamarind concentrate. Taste for seasoning, you might want to add a little of this or that. Let sit for 10 minutes or so off the heat before serving. Serve with basmati rice and garnished with extra cilantro, if you like! Yum!! I make variation after variation of this with so many different ingredients… and I just love it. Chana Masala is one of my fav foods ever.. and I totally agree about the coconut oil.. so good! I’ve been using my homemade coconut butter in place of the oil with GREAT results too.. and I think it out with chickpea cooking liquid..
BTW, I love the plate! Can’t wait to try this! Out of curiosity. Do you have a favorite INdian place on CIA? No, all the places I grew up with are long gone as far as I know. Im surely going to try this version and gives me another reason to play with naan (manjulaskitchen showed me how to make naan with her kinda-best-ya-can-do-without-a-tandoor method). happy tums. Yum! How timely. I just tried to make some chana masala in my crockpot and accidentally burnt the shenanigans out of it. After reading your recipe, I’m eager to try again and will definitely be trying a couple of your touches like the coconut oil and lime juice! This sounds fantastic. I’m semi new to vegetarianism and Indian food, so this will be a challenge. BUT, I am excited about it nonetheless. Love your site by the way. Found it through Zen Habits and am thoroughly enjoying it so far. Mmmm I love a good chana masala. So healthy! I made this tonight and it came out awesome mine came out a little mushier because I used some overcooked chickpeas. My next project is gonna be the Romesco Pizza which should be a hit cause my roommate and I love Chickpeas Romesco. looks wonderful, i am on a diet and want to know if there is a way to make it without the oil? Sure, you can water saute, or just use a much smaller amount. I would recommend 2 teaspoons oil, since it is 10 serving, that won’t be very much and you can still get all the necessary browning. This looks awesome! Going to make this soon. You wouldn’t happen to have a recipe for Chana Saag? That’s my favorite Indian dish. Amchur/amchoor (powdered green mango) is another good substitute for the lime or tamarind. Start at a tsp and adjust. I first read this as “Chandra” Masala & I think that’s just fine. I am in the midst of making my first batch of CHANDRA Masala (thanks @AbbyBean) and had to cough like crazy at the deglazing point! So excited for my supper noms! Question: Is the spice blend similar to garam masala? Could you substitute it with that? Thanks, looks delish! One of my all time favourite Indian dishes! Looooooove this! I love Indian food, really. I made this tonight, it was amazing, I didn’t have jalapenos but I did have 2 Big Red Chillies, i cut them up seeds and all–that makes the dish have a warning for those that may be pregnant or have heart problems–it was deliciously hot. I also realized halfway through that I didn’t have any minced ginger, or agave syrup, so i chopped up some crystalized ginger that I happened to have on hand, which added the gingery flavor i needed as well as a touch of sweetness. I also used whatever tomatoes I had on hand, between 1/4 pound of cherry tomatoes, 1 big regular tomato and some diced canned variety it worked out. Definitely going to try again and maybe only one small red chilli instead of 2 big ones. This is exactly the sort of thing I love when it comes to Indian food. Heavily spiced with lots of chickpeas and that telltale turmeric color…mmm! Yum to the yum. This looks flipping amazing. Is it weird that I think I can smell it? We make a lot of coconut curry indian-spiced stir fries, but I’m always scared of making chana masala. This is going to be my inspiration! I was told this is the best meal I’ve ever cooked. Thank you. “And it’s VEGAN!” is what he said. made this tonight! Yummy!served it with chapati. This was so delicious! Thank you!!! I’m doing the recipe this weekend! 🙂 I love anything with tomatoes, so thanks for sharing! Ooooh, I just went on a spice splurge and have been looking for a great Indian recipe that includes cardomom and coriander. I can’t WAIT to make this! Looks amazing! did it the day before yesterday and I STILL can´t get over the delicious awesomeness! This recipe was full of win! A big plus was that it made great use of our garden’s bumper crop of tomatoes. It thickened beautifully over night too so the leftover are even better! I’ve been in search of an easyish chana masala recipe for YEARS (and years), so I’m so grateful to you for this. I can find all of these ingredients at my co-op, and I don’t need a pressure cooker or a zillion steps or a day and a half to prepare it. Thank you! Thanks, too, for tips about tasting for the salty, spicy, and sour and adjusting. Advice like that has made me a better cook, because it gives me skills I can use with other dishes. So, I’ve made this twice, half batches both times, because I’m cooking for one and with 8 to 10 servings I would’ve been eating it every day for a week. I found the recipe not quite as spicy as I like, maybe because I’m used to spice-inflated versions at the restaurants I go to, so the second time instead of halving the original amount, I used 2/3 (for the salt and lime juice too) and left out the agave altogether. Just right! Yum. Also, my portion sizes may be off (when I eat chana masala, i don’t mess around), but my half-batches gave me only three moderate entree-size portions. If I were serving this for four people, I definitely would not halve it, especially because I assume most people would want seconds, because it’s delicious. Ahhhhh…..I cooked this tonight, and my husband says it’s the most authentic, yummy dish he’s had since we lived in India! Thank you…and mmmm. I made this last night with naan and rice. The combination of spices with coconut oil and fresh lime juice was amazing. I agree that the recipe makes a huge amount but I froze half and will see how that works out in a couple of weeks. I made this and was a little overwhelmed by dicing 3 lbs of tomatoes, but I got through it. I don’t like fennel seed so left it out. I could not find cardamom so I had to use a garam masala spice mix I had with cardamom as the main ingredient. My grocery store also didn’t have coconut oil the one time I went to go buy it… can you believe my luck? I put some coconut milk because I like my curries that way and I could adjust the consistancy to my liking very easily. This is a forgiving recipe that is easy to modify to your taste or ingredients. When I thaw the extra I have I’m adding more cayenne, and making some naan to go alongside. This was so good. We used the left overs as “taco” filling inside a corn shell the next night. Amazing! Sampled this in the pan and wasn’t entirely sold. Then I got it on the rice and nearly died of joy. Thank you for providing an even-tastier version of my takeout favorite. Looks tasty! I have always been fond of Indian foods and thanks to this blog I can now get a taste of Indian foods. This didn’t really work for me. The coconut oil was overwhelming and it seemed under-spiced. At least now I have a base, though because the spice combination is excellent. I made this tonight and it was really delicious. It could have been spicier but I put a little bit less pepper than required. I would also put a little bit less lime. That gorgeous burst of scents when I added the spice mix to the pan made me smile in anticipation and the deliciousness of the finished dish lived up to that glorious smell. made this tonight for dinner… yum yum yum. definitely going in the rotation. finally got around to making this. apart from having to soak and cook the chickpeas (which i did the day before, and was well worth the effort for someone used to using canned beans! ), this was surprisingly easy. and so delicious. thanks again, isa. this and the cashew korma are so good, and make me feel accomplished! Does anyone know if the tomatoes should be seeded? I loved this. My non-vegan husband thought it was great too! I think this should go into the Gluten Free section as well. Look sGluten Free to me unless I’m missing something. Looks soooo good, but I can’t eat tomatoes. Any ideas? The story goes like this. When you first posted this, I made it a few days later. DH and I enjoyed it immensely, and lamented once it was gone. Yesterday, I made another batch. Afterward, though we currently have leftovers, I set another batch of chickpeas to soak. It’s that good. 🙂 Thank you for all you share and do. I think I have nearly all of your cookbooks at this point and have already enjoyed several recipes, though this one certainly would be on the shortlist of “And your last meal will be?” I look forward to cooking and enjoying more of your recipes, you’ve made my transition to vegan a most delicious one. Thank you so much for letting me know! It’s stuff like this that keeps me inspired. Thank you so much for sharing this recipe. It is my go-to recipe for my lunch meals. I make a batch on Sunday, and it’s my lunch M-F. So far, I haven’t gotten tired of it. As we come to the end of fresh tomato season, I’m kind of dreading making this with canned tomatoes. Any tips? My main concern is that canned tomatoes don’t break down the way fresh tomatoes do. Maybe start with whole canned tomatoes and dice them up small? Help! Thanks!! Yeah, just dice them, it will be good! I sometimes just squish them into small pieces with my hands if I’m feeling lazy. Stupid question: I’m not a native speaker and my dictionary translates cilantro and coriander as the same thing. Is there a difference other than that one is fresh and the other is dried? Thanks a lot for your help, I will try this tonight! When I say coriander it’s referring to the dried seed and cilantro is the fresh leaf. This turned out great! I didn’t have agave, so I used molasses instead to add some sweetness. Thank you for this fantastic recipe. I am looking forward to making this tonight. I soaked the dried garbano beans overnight. About how long do I cook them and what should the texture be like? Thanks for guidance on this. It varies depending on how old the beans are and other factors (like water temp, how long they soaked) but you should cover and bring to a boil, then immediately bring to a simmer, leaving the lid askew so that some steam can escape. Check in about an hour and just cook until they are soft enough to eat! Made this last night and it was AMAZING! I love the heat it packs too… And was so easy so I think it’ll be a new staple in my vegan recipe repertoire. Thanks!! I stumbled onto your site via the Melie Bianco blog. 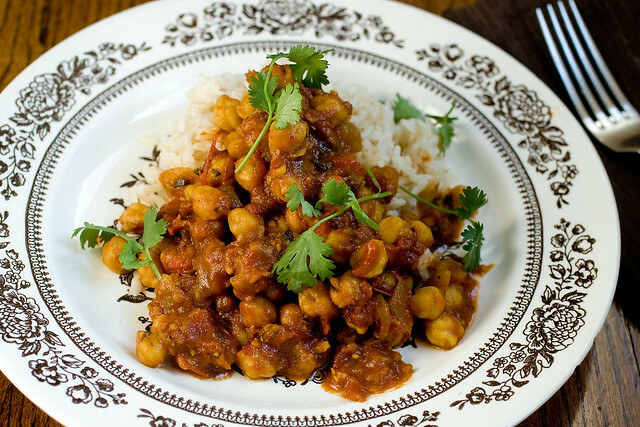 Your chana masala looks great! I can almost smell the cilantro. The tamarind and jalapenos are bound to give it an extra kick. Must try it out. I really appreciate cooks who take the trouble to mix their own spices…alas, in India, we are spoilt by ready-mixed packaged masalas for every kind of curry we cook! Love the look and feel of your blog, I’ll be sure visit regularly! OMG! I made this tonight for my mother-in-law who said: “This is the best thing i’ve ever put in my mouth!” I concur. This recipe is gorgeous. It is far better than any chana masala I’ve had in a restaurant. The flavors were so “alive”. I servied it with brown basmati rice and mango chutney, sweet-hot pickles and a little plain soy yogurt to cool it down. Sooooooooo good. I will definitely be making this time and time again. Thanks Isa! This was the best curry I’ve ever cooked! Or tasted, I should add :). 1. Kachumar makes a good accompaniment: Finely chop onion pieces or rings, rub with a little salt, red cayenne, black pepper. Add tiny bits of cucumber and tomato. Mix everything well with lemon juice. Add finely chopped cilantro (coriander leaves). Or leave out the lemon juice and add sour soy yogurt. Eat! 2. Adding cubed potatoes to cook along with the already cooked chick peas is also good. Made this tonight and it was awesome! We couldn’t stop eating it! I amped up the salt and the tamarind, but other than that followed everything else to the tee (or should I say to the t as in tsp, Tbsp?). Thanks for yet another great recipe to add to our family dinner repertoire! Made this for what might be the 1000K time tonight. Each time it is special and tonight Actually been feasting on Isa fare all week (from AFR, Veganomicon, Brunch, Cookies, etc.) but could not declare the week complete without our absolute favorite dish (and let me say it has some pretty stiff competition). Isa, I want to say thank you again and again. I’m only 6 months vegan, and my husband hasn’t declared anything… but he has been absolutely enchanted by the dishes that I make that you wrote or co-wrote. I know I said thank you before (probably on this particular thread, LOL!) but I wanted to say it one more time… THANK YOU! Much love from a fellow Brooklynite! I just wanted to double-check the chickpea amount…it seems that 2 cups dried will produce quite a bit more than 3.5 cups. It probably depends on what kind of chickpeas you use, but they should be between 3.5 and 4 cups. I just made this, and “My life just got so much better!” flew through my mouth. THANK YOU! Just made this and had it for lunch. I can’t wait until dinner. <3 SO GOOD. Great diet food too. I should also mention that my new favorite smell is that of onions sauteing in coconut oil. MMMM. I made this tonight! 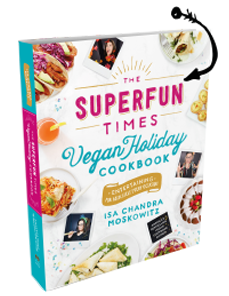 I’m a new vegan and the most challenging thing so far has been finding new/easy recipes. I absolutely LOVE Indian food and I have plenty of Indian spices so it was easy to make… It was DELICIOUS!! I didn’t have a few of the ingredients (agave, jalapenos, lime)… but no biggy – it was great! You are truly the best. I’ve been vegan since September and have tried a ton of recipes but I am always utterly impressed with everything I make of yours. I am having some non-vegans over tomorrow and I can’t wait to watch them eat this! Thank you for everything! so good! I couldn’t believe how this tasted exactly like a local restaurant’s chana masala. Thank you for all your research and delivering us the best recipes! This is a great recipe. Thanks for sharing!! What are some good vegetarian meal ideas for a birthday? What is a good and east vegetarian meal for two that I can make for my gf? Being the incredibly lazy person I am, last night I attempted to make this dish without a much needed trip to the grocery store. I subbed canned tomatoes and pickled jalapenos for the fresh stuff, and left out the cilantro. And miraculously, it still turned out amazingly. I’ll definitely be making *Chandra* Masala again; hopefully the official version is as tasty as my pantry/lazy version! Just made this last night and it was fantastic! Thanks for the recipe! After becoming Veg about 2 months ago, I had tried a number of different Curry Recipes, and all were dismal failures – until this one!!!! Have made it twice in the last week, and even my daughter who doesn’t like Curries thinks it’s delicious, as has a number of meat eaters who have tried it. Thank you SO much for sharing this ‘keeper’ recipe! Thanks for the great recipe! It was delicious! Fantastic! Even though I used (28oz) canned tomatoes and canned chickpeas. Really, really tasty. I have cardamom pods. Does cardamom also come in a powder (and would that be prefereable? Thanks! Delicious. I did a few different things for this recipe — spinach instead of cilantro, half a cubed potato, a touch of garam masala and mango powder. It’s one of those dishes that can be spiced up to one’s liking. Just wonderful, ah! Made this yesterday. It is a wonderful recipe! I used the coconut oil and it worked great. Directions worked perfectly. Thank you for posting this. Everything on here looks great and I can’t wait to make something else. Just when I was tasting and thinking to myself it is missing a little something, along came lime joice and added the final dot to my chana i. I did go a bit overboard with ginger (but I adore ginger and it is good for me so no biggy), skipped the alien jalopeno and added the alien pineapple instead and now my only concern is how to stop eating in time to keep the bowl! Too good! This became one of my go to recipes. It is delicious and it’s easy to add some frozen chopped spinach a little before you stop cooking it. I could not agree more that fresh home-grown/organic/heirloom toms really take this dish to the higher level. This is simmering on my stove as we wait for Hurricane Sandy to blow our yard apart, and all I have is a tamarind paste (puck?). How can I incorporate this into the recipe? So far I’ve got a bit soaking in a bowl with some hot water to loosen it, and have pulled out the seeds. Should I strain it, or just throw it in pulp and all? And thanks for all the awesome recipes! I usually blend the pulp with some of the soaking water. My mom uses jalapenos in some of her curries; can’t remember if she puts it in this, but it’s perfectly fine in Indian dishes. 🙂 There are many different versions of the same Indian dish depending on what part of india the cuisine is being prepared. I can’t recall where this dish is prominent, however I do remember my mom saying that a traditional way to make it involves tea bags. I haven’t looked it up, but I bet you could google it. I grew up eating it with sautéed onions, rather than the garlic and ginger (although that sounds delicious as well). We always throw a good amount of fresh cilantro on top of most dishes, rather than cooking it in. Another variation to make it more traditional would be to use ground paprika (the Indian version is pretty spicy!) in place of the cayenne and to omit the black pepper. I like different versions of the same dish and yours sounds tasty as well. Oh yeah, and garam masala is a spice I would definitely include in this dish. Thank you so much for these recipes, your books are the reason myself, my husband our parents and friends in Ireland eat vegan. Making this for about the 100th time tonight. Having an Indian potluck and this dish is a winner! Everyone freaks out over it when I make it. Sometimes I throw in some mustard greens or spinach and it’s good like that too. Cannot get enough of it! 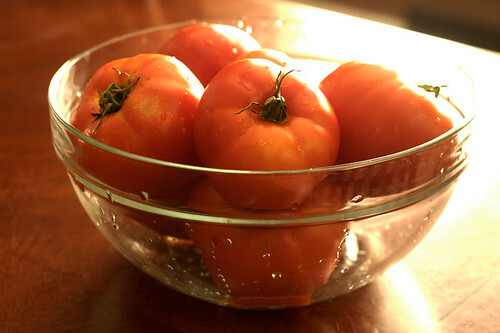 (I am so grateful for the fresh tomatoes too). Just thought I’d tell you again. Your recipes rock. I made this a few nights ago and it is super yummy. It has the perfect amount of spiciness. It is one of my favorite dishes and will definitely be in my frequent recipe rotation. Just made it – fantastic! Can you tell me if you start with the dried chickpeas, or already cooked chickpeas? If cooked, can you tell me how to prepare and cook them? Thanks! They are cooked (says so in the recipe!) It’s really easy to google “how to cook dry chickpeas”. Good luck! Hot damn! I have tried several channa masala recipes, and they have always come up short until now. This recipe was so frickin’ good! Thank you for giving us such a great balance of onion/ tomato/ chickpea and sweet/ sour/ salt/ spice. Delish. I was just referring to this recipe to make for the 8th million time and I just noticed it says it serves 8 to 10. People? Humans? Are you crazy? Have you tried this? It’s always been a solid 3-4 serving recipe for me. And that is controlling myself. Haha! Well, I usually make it with rice and a salad, so maybe that’s why. So good and authentic! Will make again and again! Thanks for this recipe I just made this today, it’s lummy lummingtons! This is a wonderful, very tasty recipe, but I wonder if you have rethought the use of coconut oil since writing your cookbook on reducing. I know that classic Chana Masala is often made with coconut or coconut oil, but I did not use either of them because of the high saturated fat content. Also, I reduced the oil to 1 tbsp. of canola oil and probably could have used just canola spray–the onions will still brown in a nonstick pan and the spice mixture will not stick to the pan. Thanks for your good work. made this last night for the first time…what a great recipe! really fresh taste from the lime juice. i didn’t buy coconut oil, but maybe will splurge since i will be making this again. mine was a little watery, so maybe i should have simmered it longer or if it happens again i may make a roux or add tomato paste. The spice blend is good in this, but I found it quite strong, so I tempered it with a can of coconut milk, and about 500g of frozen spinach, it made it very tasty, substantial and rich. Didn’t use cilantro, substituted tinned tomatoes for fresh ( 2 cans), and didn’t use cloves as I didn’t have any. It was pretty good and I’ve made it twice since! This was so delicious! I ate it all week and my husband (omnivore) really liked it too. Thank you so much; this is a hit! I will get a bit more heavy handed with the spices next time. Just made this and it’s amazing! I only put one jalapeno and it was perfect. Definitely making this again! Thank you for making this, and many other recipes, so big. I have a largish family and I’m always having to double recipes – but not yours!! I make this all the time. Everyone loves it, and everyone can eat it. It’s a staple recipe for me at this point- so delicious! I made this last night for dinner and just had some for lunch. It is oh, so good. It’s just perfect. My mission for the winter is to try A LOT more Indian food. Thanks for the great start and the inspiration. This looks great. I’ve tried so many chana recipes, but your blog is so compelling I will have to try this. I found your website today and I just had to made something! I chose this as I had all the ingredients and it was AMAZING! Even my family who eat meat loved it. Thanks so much! I loved this. We added half a can of coconut milk to it and I couldn’t keep my son out of it. A great recipe. I’ve made it many times. All the flavors come together very well. I do change a few ingredients: water instead of oil, quinoa instead of rice and I double the cayenne-I like it spicy. Sometimes I add kale for the heck of it. Love the recipe Isa and hope you came back to Austin!!! I have a chana masala spice mix. Can I use this instead of making the mix, if so how much would you start with? I’ve been trying versions of this for YEARS with bland results. Thank you! This is freakin’ rad. I love your recipes! Isa, God bless you for making this recipe- I make it regularly and it freezes wonderfully, which is good for me being the single college student. Just cause I’m curious any fun twists that could be put on this? Your wwriting taste has been surprised me. Thank you, quite great article. This turned out amazing, I loved the flavor, and with some rice, it makes a very satisfying meal. correction needed indtead of meld, it should be blend. This has been my favourite version of Chana Masala for several years now, loved as a comfort food staple by my omni family! Bit of a newbie question but when you dice the tomatoes do you use the juice/seeds as well or just the flesh/skin part?